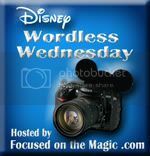 Thanks to Deb @ Focused on the Magic for hosting the Wordless Wednesday Blog Hop! Love the picture of the beach. The way you used the palm trees makes it a step above. Who wouldn't want to be there relaxing right now! awwww yeaaahhh... you'd never know how close the chaos of the parks are with this shot! Beautiful picture! Postcard perfect and so relaxing! Thanks for sharing and for joining in the DWW Blog Hop today. Great pic! I love that even in WDW, you can enjoy a relaxing day at the beach. Beautiful! If I could transport myself there right now I would! What a beautiful and perfect shot for this week's theme! What a great spot to just hang out. So nice...wish that was my view today! A little patch of paradise!! **sigh** looks pretty darn relaxing to me! They even saved that hammock for me... sweet!